Hortus Camdenensis | Narcissus tazetta L.
Very variable bulbous perennial with erect, broad, twisted leaves and up to 20 sweetly scented flowers with white to bright yellow perianths and white to yellow cups in winter and spring. To 50cm. [RHSE, Hortus, Baker Am.]. Botanically described under this name by Linnaeus in 1753 [Sp. Pl. p.290/1753]. A very variable plant: ‘Of the multiform Tazetta narcissi, about 100 have received specific names.’ [Baker Am.]. ‘Tazzetta means “small-cup” and is the name given to these flowers in Italy from the shape of the crown. Linnaeus has spelt it with one z instead of two.’ The plant figured here strongly resembles the common garden variety ‘Soleil d’or’ [BM t.925/1806]. See also Narcissus tazetta subsp. tazetta, Narcissus tazetta subsp. 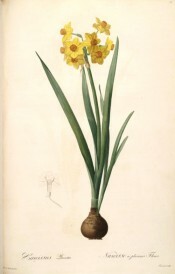 italicus, Narcissus tazetta subsp. tazetta var. trewianus, Narcissus tazetta L. subsp. tazetta var. floribundus, Narcissus tazetta L. subsp. tazetta ‘Baselman minor’ and Narcissus tazetta L. var. ‘Soleil d’Or’. ‘A hardy species, but whether indigenous out of any garden I know not. It forces well, and on this account, as well as the orange tint of its flowers, is much cultivated, though the odour is not the most agreeable. When left to multiply in the open border, it produces comparatively few flowers in a bunch, unless the soil be very deep.’ [THS vol.1 p.361/1805-1812]. Johnson's Dictionary gives a date of introduction from Spain of 1596, although Paxton's Dictionary gives a later date, 1759. Redouté L pl.17/1802-1815. Listed in all published catalogues [B.349/1843]. Many narcissi are naturalised at Camden Park, particularly on Blarney Bank. Most of these are tazettiforms with a strong affinity for many of the plants described in the Hortus, others are clearly of more recent origin.